So, yesterday was kind of a waste of editing time, but I got a lot of other stuff done. 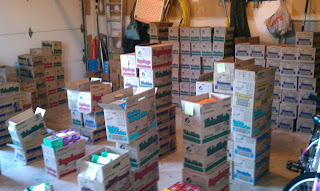 It was Girl Scout Cookie pickup day. There's a shopping mall near my house that went out of business, and all the cookies for our region were delivered there. The deserted parking lot was arranged just for us, with a line of semi-trailers full of cookies, one truck for each variety. We paraded past each, and loaded up. We ordered more cookies this year than ever before, and we had my truck, the leader's SUV, and another dad's Sprinter van. Now we know, you CAN get 256 cases of cookies in a Sprinter. Yikes! We hauled them all back to the leader's house to sort. Here's a picture of SOME of those cookies. There were more behind me. There's just too many to fit in one shot. After moving all that mountain, I had to hang around and wait for each girl to pick up their order. I figured it would be perfect, sitting out in the garage in a lounge chair working on my edits. HAH!!! Do you know how cold it feels when it's 41 degrees and you're sitting perfectly still? REALLY DAMN COLD!!! So I ended up moving around a lot, going back and forth into the house to thaw out periodically, and eventually giving up and coming home. I am so sore today. Only adding to my soreness is the fact that I'm a big dummy who fell asleep on the couch last night. Tim sent me to bed when he got up to go to work, but the damage had apparently been done. I am question-mark shaped today. At least I have cookies to cheer me up. And I had pancakes for dinner last night. That's what Tim and Lulu made, and they saved me the leftovers. I love it when we have breakfast for dinner. On the down side, I didn't get much editing done, but I realize I'm nearing the end of this round. I think one more read-through ought to do it, and then the betas can have at it.